You watch because, at the core, it's a fascinating game. It's speed and power and quickness and endurance. It's nine innings, and the clock doesn't matter. The little guy who can't hit gets almost as many whacks as the big bopper. And you search for a reason to care. their faith tested once again. The captain is gone, and the all-star, and the MVP, and two of the pitchers, and the home-run leader. What remains is an overmatched nine and a bunch of blue seats. So why should you watch? Back in the bad old days, which really were worse than the bad new days, I did an article asking players why fans should bother to pay to watch this team. The beer is cold, one player told me. You can see young talent at its inception, another said. Finally, I asked a member of the coaching staff. And he wouldn't say. Finally, he looked at me and said "Off the record, do you want to know why I wouldn't answer?" "Because I wouldn't pay to watch these guys," he said, laughing. And there you have it. A winning answer on a losing team. Cotten-Eye Joe on the big board. Good thing. No one kneels for the National Anthem. Can this team lose 100 games? Discuss. If the Rays don't move to Montreal, could we just send them the Catwalks? The Rays this season will feature bobbleheads from Carl Crawford, Fred McGriff and Tina Martinez. Does the team plan to party like it's 2004 all over again? How many strikeouts will the Rays finish with? Last year's free-swinging bunch had 1,538. How many games will this team win? Sixty? Seventy? Seventy-five? Discuss. Can C.J. Cron hit more than 16 homers? He's hit exactly 16 for three straight years? Who leads this team in home runs? Last year, Carlos Gomez had 17, Cron had 16, Kevin Kiermaier had 15 and Wilson Ramos had 11. Discuss. At the bottom of the rotation, who wins more games? Jake Faria won five, Matt Snell won five and Matt Andriese won five. Discuss. Set your watches. How long is it until it's Willy Adames time? Which former Ray will hav the best season? a) David Price; b) Wil Myers; c) Evan Longoria; d.) Corey Dickerson; e) Logan Morrison; f) Logan Forsythe; g) Ben Zobrist; h). Joe Madden; i) Andrew Friedman; j) Tim Beckham; k) Alex Cobb; l) Steven Souza m) Jake Odorizzi, n) Andrew Friedman; o) Matt Moore; p) Fernando Rodney; q) Lucas Duda; r) Brandon Guyer; s) Dave Martinez; t) Jim Hickey; u) Erasmo Ramirez; v) Matt Joyce; w) other. In Take Me Out to the Ballgame, do you care if you ever get back? How many games would the Rays have won this year with everyone back? Discuss. If Lou Piniella catches a game, does he think he's in a flashback? How many games will they win with almost no one back? Discuss. How many one-run losses will this team have? Well, like Roman I am optimistic. In spite of the bad press, the payroll for 2018 opening day will be higher than it was in 2017, may be the highest ever for the Rays. The “bullpen” days will be a starter from AAA up for the start, 4-5 innings hopefully. Lots of arms up and down – don’t forget, the LA Dodgers used 26 pitchers and 26 position players last year, and our minor league depth is as good as theirs is. More runners on base, more speed, less strikeouts, better defense, we can stay competitive. 80 wins. Finish 3-4, probably not a wildcard berth. Fun team to watch. Probably a major deal at the trade deadline, maybe Archer, which everyone that doesn’t think he’s any good today will bemoan as another failure on the part of the Rays, but it is the way small market teams do business. I expect to watch most all the games, 23 of them in person, see you on the press level! GO RAYS! I’m glad you’re optimistic. Really, I am. But if this team wins 80, Cash should be manager of the year. I just don’t think there is enough juice in the lineup or proven starters in the rotation. Hope I’m wrong. (It happens a lot). The Rays are going to be pretty irrelevant this year. They will finish at the bottom ( SI says 95 losses). The will look like a walk off on the opposing teams schedules! This should be a record low in ticket sales and TV ratings! Personally I won’t waste my time watching or listening to their games! I will follow the Cubs because of Joe but any news on the Rays will come from this site! Baseball honestly has never given me the what the NFL or the NHL can! I will be looking forward to reading how you will make articles about them interesting! Bill, I was just rethinking my position after Roman and Cecil, and then you depress me all over again. Hah. I agree with you, but I hope I’m surprised. I do think the defense will be better, but I wonder if there is enough pop in the lineup. The Rays will be better than most people think. The have traded strikeout for contact; that’s like having a quarterback who is good at being a “game manager.” The speed will help. Last year the Rays were one of the top team in OBP but near dead last in runs? Why? All of these great jettisoned slugggers were as reliable as a customer service rep for a government agency. Better speed and defense will show up. Gone are the name but, in its place are the plays that will win more ball games. The fifth spot will work itself out. I can see either Yarbrough, Chirinos, or Andriese winning that spot come May. I hope your right. I don’t think they’re going to be very good. Granted, they’ll make more contact and have more speed. They’ll have less power. Big question: How many do you think they’ll win. Sir, there was a great article by, I think, “baseball prospectus” where they were talking about the Rays playing one-run games. The piece talked the Rays and losing one run ball games in the past, it turns out that the Rays are built on playing close games, and they were just losing the games in tight contest. Pretty good read, if I can find the article I will email the link to you. 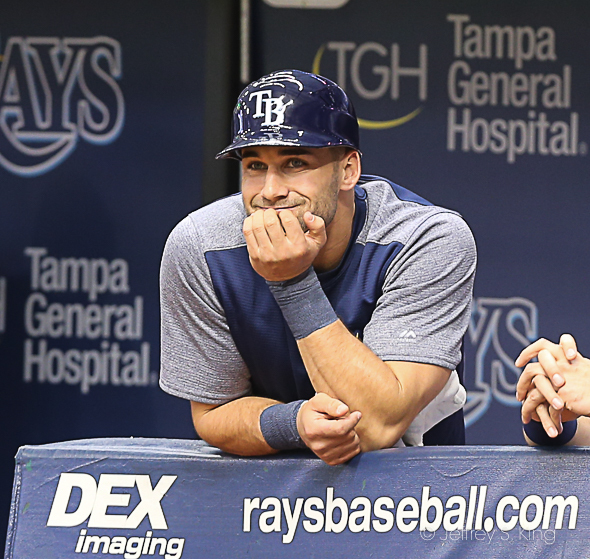 Like the article, I feel that the Rays will play tight one-games the majority of the year. The speed will fill holes and keep the Rays in games. The pitching will neutralize the opposing offenses. They will tax the bullpen if not managed precisely. The bullpen usage will clearly be the key, in opinion. Fifteen games is quite a swing. If Cash wins 87, he’s manager of the year. I can think of a few more questions about this team. How many guys will be gone before the trade deadline ends? How many more pitchers will go on the DL? Have Tommy John surgery? How many bullpen pitchers will be shuffled back and forth from Triple A? How many bullpen days will it take to wear out the bullpen? How many times will the starter pitch into the 6th inning? How many games will Matt Duffy miss while being on IR? How many different guys will play third this year? Will attendance hit rock bottom this year? How long before Bucs training camp? Previous post: Should the Bucs trade down in the coming draft?